Money is supposed to be abstract. We think of it in terms of what we can buy with it, not what it is physically. Beyond its denomination, and whatever cultural or political figure it happens to be celebrating, we're not supposed to think too much about a bill or coin as an object. But what happens when, in the midst of an economic crisis, artists are given free rein to make their own currency? When paper money becomes not just capital but a consideration of it—a commentary on currency, and a meditation on value? In 1914, as Germany entered into World War I, the country suspended its gold standard, temporarily halting the exchange of paper marks for gold to prevent a run on the banks. No longer tethered to gold, the value of Germany's paper currency began to inflate, and scared German citizens began to hoard coinage. As a result, the raw metal worth of a 50 pfennig or 2 mark coin quickly outstripped its face value. (Nickel and copper could be used in the growing military industry.) The German economy ran on these coins: a shirt might cost 5 marks, a pair of shoe soles, 3.75. So the sudden withdrawal of coinage precipitated a severe currency shortage—all within the first few months of the war. Throughout the country, cities and financial institutions had no choice but to get creative. 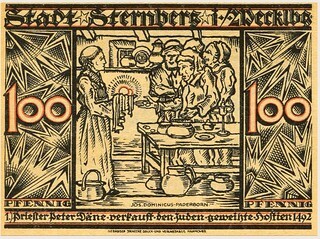 Enter notgeld ("emergency money"), whose purpose was to paper over the shortages in circulating currency. This new kind of money was never authorized by any central or state bank; it was local governments and banks, as well as employers, that introduced notgeld as a short-term, stopgap measure, a temporary currency with a fixed expiration date that functioned more or less as an IOU. 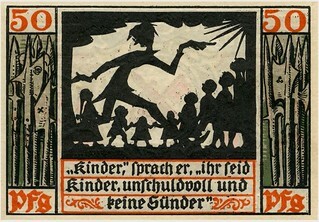 Anything could be recycled into notgeld: tickets, cardboard stock, whatever was lying around. The goal was simply to keep something in circulation that could be used for goods and services so the German economy didn't fall apart. Notgeld was illegal—one can't, after all, print one's own money—but government officials soon realized that it was nevertheless necessary for day-to-day transactions and mostly turned a blind eye. In fact, the less notgeld looked like actual marks, the better. Rare and unusual, the country's provisional currency soon caught the eye of German numismatists and notaphilists. 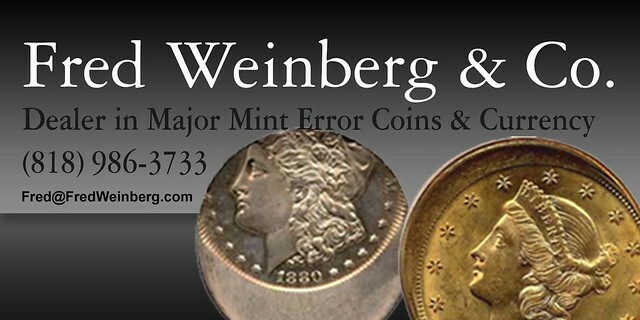 Rare-coin collecting was already a well-established hobby in Germany, so when these strange forms of currency hit the market, collectors almost immediately began to hoard them, and often wrote to issuing authorities requesting examples for their collections. The numismatist Arnold Keller was just 17 when he began collecting notgeld in 1914; three years later, he was printing his own notgeld catalogs for the growing market in ersatz cash.